A tool every restoration contractor should have! The proper operation of your restoration equipment relies on an adequate supply of electrical power. Overloaded circuits and tripped circuit breakers can waste valuable time in the restoration process. Now with the SureTest Circuit Analyzer you can check each outlet to determine the available voltage and amperage to be sure your equipment will operate properly and continue to operate until the job is completed. 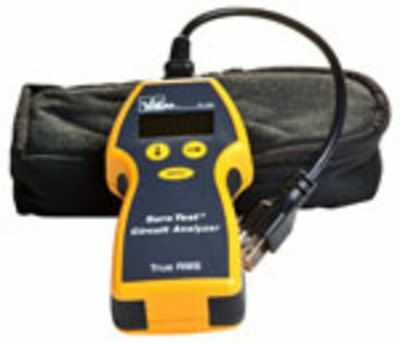 Simply plug the SureTest Circuit Analyzer into the outlet. The unit will first test the outlet to determine if the outlet is wired properly, with the proper wires to the hot, ground and neutral. Push the down arrow to the next test and it will show the AC voltage. This will let you know if you have the voltage required by your equipment. Push the down arrow one more time to test the circuit under different amp loads. This will display the voltage drop under loads of 12amps, 15amps and 20amps. Use the side arrow to move between the different load tests. Above the voltage drop percentage reading you can see the voltage available under each load. An excessive voltage drop under load can indicate defective wiring or excess load on the circuit that may cause problems. Push the down arrow one more time and the display will show the amount of load presently on the circuit. With this reading and the voltage drop reading you can now determine if your equipment will be able to operate on this circuit. You can plug in your equipment turn it on and use the SureTest Circuit Analyzer to recheck the circuit to see the available voltage, voltage drop and amp draw with the equipment running to assure that the voltage will remain sufficient to keep the equipment running long enough to complete the job. This tool is used by electricians to check wiring and can perform other functions that may or may not have value to the restoration contractor. Read the operator's manual for complete operating instructions.